CHANGES IN THE VERTICAL DIMENSION OF OCCLUSION DURING DIFFERENT PERIODS OF COMPLETE DENTURE WEAR - a comparative study. Hrisdana Hadjieva , Mariana Dimova, Elena Hadjieva, Stefan Todorov. Department of Prosthetic Dental Medicine, Faculty of Dental Medicine, Medical University – Sofia, Bulgaria. The exact determination of vertical dimension of occlusion is of great significance for the recreation of the functional, esthetical and prophylactic biological factors for the edentulous patients. Authors aim was to establish the change in mm of the vertical dimension of occlusion by patients with different duration of full dentures treatment. Materials and methods: 75 patients (44 women and 31 men) aged from 56 to 82 years, wearing complete dentures for 3 to10 years, were included in our investigation. On all patients’ plaster casts were made baseplates from photopolymerizing baseplates (TRIAD VLC Custom, Dentsply De trey) and occlusal rims from temperature resisting pink wax (Modern Pink No3 Wax, Heraeus Kulzer, GmbH & Co.KG). The numbers of measurements of the physiologic rest position for every patient were 10. After calculating the average value of measurements the result was minimized with 2.5 mm thus giving the vertical dimension of occlusion (VDO) for the new denture treatment. Results and discussion: By 49 patients (65, 33%) the difference between the VDO with the old dentures and the new treatment was from 2 to 3.99 mm. By 17 patients (22, 67%) that difference was from 4-5.99 mm and by 9 patients (12%) - from 6-8 mm. By all the patients the VDO had to be increased with 2-6 mm by the new treatment. Hadjieva H, Dimova M, Hadjieva E, Todorov S. Changes in the vertical dimension of occlusion during different periods of complete denture wear - a comparative study. J of IMAB. 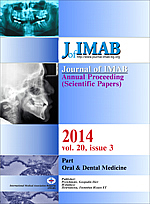 2014 Jul-Sep;20(3):546-549. doi: http://dx.doi.org/10.5272/jimab.2014203.546. 10. Winkler S. Essentials of complete denture prosthodontics / Sheldon Winkler and twenty-nine contributing authors. Philadelphia: Saunders. 1979. p.189-192.